Okay, time to get back into some photography. Spring flowers always do that to me. Last week the crocuses were just starting. This week we have LOTS of crocuses. I’ll post more pictures tomorrow. Some time last year I was doing something by the pond waterfall and thought to myself, “Huh. Wasn’t there a shutoff valve on the piping for the waterfall somewhere around here?” But I couldn’t find it. And then I promptly forgot about it. We have a fairly big pond, with a pump that sends pond water through pipes up a small rise and over a big rock to run down a short channel layered in pebbles and rock ledges and back into the pond. (It’s called a “pond waterfall” but that term can only be applied accurately if it’s applied very loosely.) But it looks nice and it sounds nice and the birds have baths in the channel. A couple of years ago a big tree fell on the big rock. It didn’t appear to damage anything, but we realized that summer that the rock’s angle had changed very subtly, so some adjustments to the piping were necessary to keep the water going in the right direction. But even with those adjustments there seemed to be some leakage, so this year I decided to see what I could do to fix the problem short of engaging a backhoe. So once the water level had dropped till the pond contents were mostly mud and the pump was turned off it was time to start work. So that’s what I’ve been doing for the past couple of weeks. I’ve dug out a section of the smaller rocks and cleaned up a top section of liner. And then I started the pebble rehab on the outside. My god, what a job. 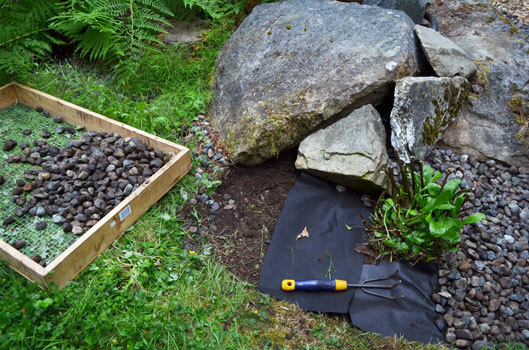 It consists of digging up pebbles—yes, digging them up, they’re buried under years of forest debris that in our climate quickly turns to dirt—and sorting them into a clean pile, then more or less levelling the dirt (filling in the pebble holes, anyway), laying new landscaping cloth and replacing the pebbles on top. It takes an hour or better crouched bent over on a gardening stool—oh my aching back—to do an area about two square feet. The photo gives an idea of the process. It was cold and sluggish to the point of near immobility when I first picked it up, but the warmth of my hand made it rather lively quite quickly. So taking a picture consisted of kneeling on pea gravel (ouch) trying to hold the camera with one hand while using the other to keep it corralled long enough to snap a couple of shots. (An interesting challenge when trying to avoid camera shake.) This isn’t a great image, but it was the best I got. We’ve seen these little guys a few times before, and last summer I’m pretty sure I saw one laying eggs in our pond. So go, newts! They’re nice little neighbours to have around. The freezes have ended. The snow and ice has melted, and the storms have filled our cistern. Consequently I’m considering a new approach to weeding in my garden; just drown the suckers. It’s not as high as it’s been some years (yet) but at this rate it shouldn’t be long before this is a viable alternative for the raised beds. Oh, and the lovely branches and reflections of branches? That’s what the willow does over winter. I swear, all you have to do is sneeze and half a dozen branches fall off. So one of the things I need to do before I can do anything else is uncover the yard (and garden) from knee-deep willow clutter. It’s that summer squash again. I’ve tried planting squash in the garden a couple of times, but never had much luck; they seem to want more sun than this garden gets. But ever the optimist, I keep trying. This summer I planted summer squash. This is a kind I’ve never actually eaten before, much less grown. So I didn’t know what to expect. What I didn’t expect was a zucchini crossed with the Eggplant That Ate Chicago. I also planted a ground cherry (and the seller didn’t warn me about that, either). They’re side by side and seem to regard the garden as a botanical Coliseum for no holds barred combat. They both keep GROWING. And it’s not as if they taste wonderful. As you can see, the squash made its way out of the raised bed, and across the walkway, and up the fence, and is now on its way down the fence. God knows where it will stop. I’m sharpening the machete. All you snooty flowers out there, blowsy show-offs in your fancy seed packages—think you’re so wonderful, don’t you? Well, take a look at REAL beauty! I figured I’d add something for contrast later, but haven’t gotten around to it so far. But no worries, nature did it for me, depositing a leaf from the ornamental plum in Just the Right Spot.